It is hard to believe that on Friday, it will have been six months since I started this blog. Initially, I had planned to focus the blog on my experiences working through vintage knitting patterns and my interest in history and genealogy. 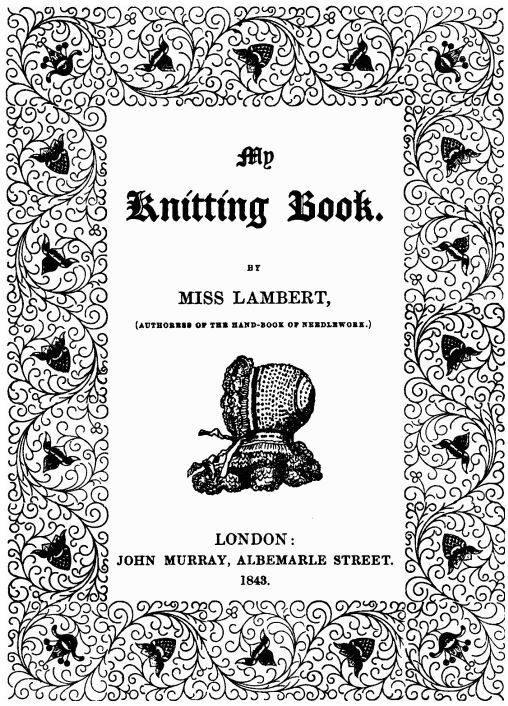 Over time, the blog has evolved into a place to share what has become a long-term project to work through all of the patterns in Miss Lambert’s My Knitting Book (1843, First Series), with occasional historical and genealogical tidbits. There are about 80 patterns in this book, so this project could keep me busy for a while! Initially, I started the blog as a project just for me, something that I could focus on when other parts of life aren’t as easy as I would like. I was surprised to discover just how much I truly enjoy the process of reading, researching and recreating these old knitting patterns. With no images of the finished objects in the book and few images elsewhere, each project is like solving a mystery. When I start each project, I am not really sure how it will turn out or if I will like the outcome or even wear the finished object. Some people would say, why bother knitting something that you might not like? Why waste your knitting time working on something when you don’t even know what it looks like? I think the answer is multi-layered, but I do love a challenge and I am a process knitter. To me, the process of knitting is just as satisfying as the finished object itself. For these 1843 patterns, I dive in, embrace the inherent mystery of the project, apply the knowledge that I have, do some research if needed and in the end, I have a created something that women in the 1840s also created. This gives me a satisfying and stong connection with the past. This project has also inspired me to begin to design my own patterns, incorporating variations of these 172 year old stitch patterns into modern day styles. To celebrate this milestone (and, incidentally, my birthday!) my patterns are available for a 43% discount on Ravelry using the coupon code BIRTHDAY until midnight tonight. Congratulations! I enjoy reading about your process & progress and admire your growth as a fibre artist. I enjoy following along with you on your journey with Miss Lambert.